The trip to Seven Falls is probably the farthest I’ve trekked to see a waterfall. Roundtrip, the trail to the falls must be at least 8 miles, though it seemed much longer than that. 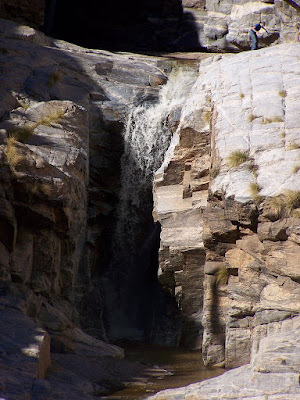 Maybe it’s 4 miles straight shot, but there is no way to walk “straight” to this waterfall. You’re going to walk up and then down, and then repeat this process over and over again. Near the end, you’ll encounter some moderately steep switchbacks. Seven Falls is aptly named, as I believe there are seven separate drops. You will also cross the stream seven times to get to the falls. This journey is NOT for the faint of heart. Along the way, my dad and I encountered someone who had just had knee surgery. The trail to Seven Falls is NOT appropriate if you’re in any way out of shape. Just a warning! You want to get onto Tanque Verde Road. From Tanque Verde Road, you will turn north onto Sabino Canyon Road. 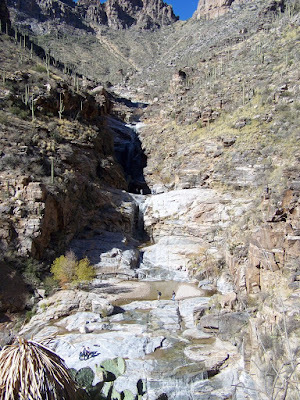 Head north on Sabino Canyon Road to the entrance of the Sabino Canyon Recreation Area. Enter, pay the $5 entrance fee, and park. ***Bring water, lots and lots of water! ***Bring very good shoes that have a LOT of give. Otherwise you’ll regret it. Where in the World is Seven Falls?